Here’s as much as I can recall learning about genetics in science class. Some genes, like the ones for brown eyes, are dominant and occur more often. Others, like the ones for blue eyes, are recessive and occur less frequently. That’s about it. I know there’s more to it than that, like traits that skip generations, but all that’s lost on me. Except to say that I know that genetically I drew the short straw on some things. As I’ve said, I do not have the gift of cooking by memory or feel. I need my recipes to lead me from start to finish. On the other hand, in my entire life I never saw my grandmother pull out a recipe when she cooked. The dishes came together, as if by magic. Fried chicken, pot roasts, stuffed cabbage rolls, chicken soup and homemade noodles all just happened. Clearly, she has the cooking gene. Then there’s my dad. I rarely ever saw him in the kitchen, other than to make a sandwich. As it turns out, he was holding out on us. Because he has the cooking gene too, but his is highly specialized. He possesses the recessive meatloaf gene. Never heard of it? You won’t find it mentioned in any textbook. But that is the only explanation I can come up with for how he can take the random contents of a refrigerator and turn it into meaty, cheesy goodness and I can’t. I have at least three different meatloaf recipes and not one of them, including Julia Child’s, comes out anywhere near as good as dad’s. So when I had the chance recently to get him in my kitchen, I wanted to absorb as much as I could. I’m not sure whether I picked up any of the meatloaf gene that day via osmosis; the last time I tried that approach was when I listened to french tapes while I slept instead of actually studying the material, and it didn’t work out too well for me then. I guess I’ll have to wait and see how I do on the next test. Class dismissed. This is a great clean out the fridge dish because you can put just about anything in it. This version is what my dad made based on what I had in stock. Heat oven to 350 degrees. In the bowl of a standing mixer, using the paddle attachment, combine everything except cheese, egg, and bacon. Add the egg and mix until just combined. Place one third of the beef mixture in the bottom of a nonstick loaf pan, gently pressing it out to completely fill the pan. Top with half of the cheese and two slices of bacon. Make a second layer with another one third of the beef and top with a second layer of cheese and bacon. End with a final layer of beef and top with the last two slices of bacon. Place on a sheet pan on the center oven rack. Cook for 90 minutes, carefully pouring off grease and juices as needed (we did this at about 30, 60, and 80 minutes). 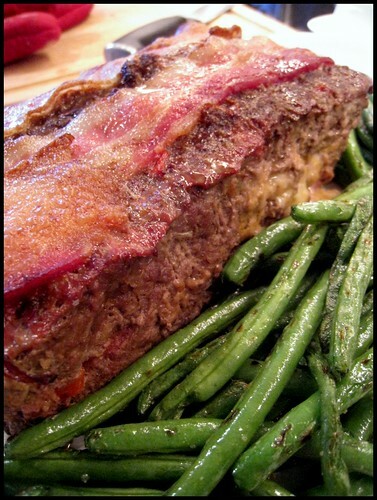 When the bacon on top is done, so is the meatloaf. Let the meatloaf sit in the pan for about 5 minutes before coaxing it out onto a serving platter. Oooo, it is like a giant bacon cheeseburger…what could be better than that?! That’s EXACTLY what it’s like. We had more “mix” than my loaf pan could hold so the extra got formed into burgers and stashed in the freezer.